It is an unconventional monetary tool which will set the interest rate beyond the so-called theoretical limit of zero percent. In this method, depositors will have to pay money to park their funds with banks. Generally, it is used in extreme deflationary situations where boosting the aggregate demand becomes tough by fiscal policy and conventional monetary policy tools. The banking sector functions in a way that when people have surplus money with them they deposit it in their bank accounts. They do this for reasons like it provides security to them against anti-social practice like theft and also monetary benefits in the form of interest that banks provide them. The banks, in turn, use this money to lend to borrowers for their needs and charge a higher interest rate than what they give depositors. This spread is called net interest margin (NIM). The higher the NIM, higher the bank’s profitability. Similarly, where there is less demand for loans the banks park their excess fund with the central bank by which they get an interest. 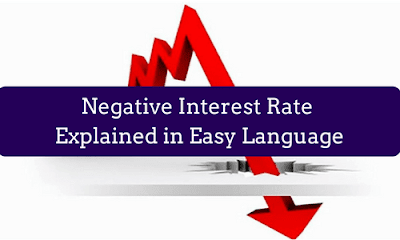 Negative interest rate policy (NIRP) means that central banks will deduct money from commercial banks for depositing their money with the central bank. Commercial banks in turn will do the same to common people. So the end effect is that people will have to pay money to banks to hold their cash. When the economy is in deflation, fiscal and monetary policy will be designed to improve the aggregate demand but sometimes unconventional tools like NIRP also should be used to boost demand. During NIRP people will not hold cash with banks as it will erode the purchasing power of their money so they will have to spend or invest both of which will increase demand and capital formation. Banks also lend at a much lower rate so as to increase the demand for business capital needs. This way there will be more money in circulation which is considered positive for economy. Negative interest rate may affect the banking sector as it will make people withdraw money from banks, so the banks will be left with less funds which they can lend, thus affecting the overall NIM. It may lead to currency war as the demand for that particular currency will reduce as there will be surplus money in circulation. The weak currency will make imports costlier and make exports favourable which is good for them in short term. But in long run it will lead to currency war as other countries also will try to devalue its currency to help its own exports. Countries like Japan are charging the negative interest rate on only 10% of excess reserves and the rest of money has zero or marginally positive interest rate so as to help NIM of commercial banks. NIRP stimulates economic growth at a much faster rate than the conventional method. Role of private sector increases as the capital will be readily available so that private investments will increase which will have multiplier effect from employment increase to increase in total production. Savings will be discouraged and investment will be given top priority by everyone. Spending will increase, thus increasing demand. NIRP, though a powerful monetary tool to revive the economy from extreme conditions, still it is troubling economist in understanding the real effects of it. It should be designed to overcome all the negatives associated with it. Extreme caution should be applied by central banks to properly evaluate it and implement to achieve the desired results.